Seven hundred prominent artists have pledged to accept no professional invitations to Israel or funding from institutions linked to the Israeli government "until it complies with international law and universal principles of human rights." Writers, filmmakers, composers and actors say their cultural boycott is a "non-violent gesture of support for those Palestinians trapped in Gaza." "I often feel in despair when I think of the suffering of the Palestinian people living and dying under an apartheid state that disregards international law and universal principles of human rights," Alexei Sayle, an English stand-up comedian, author and actor, said. According to one of the leading British filmmakers, Ken Loach, the cause of the Palestinians is "the great cause of our time." "Their oppression by the State of Israel breaks international law and the Geneva Convention. The US finances and supports those crimes, along with Britain and the European Union. In those circumstances, civil society must act," he stated. The boycott of cultural projects sponsored by the Israeli State is the least we can do. Many of us think the boycott should be more extensive!" Pink Floyd co-founder Roger Waters stated that he is supporting "all those courageous Israelis and Palestinians who are trying to make peace for themselves and for their neighbors." "Join us on the barricades. The air above the parapet is clean," Waters wrote. The group of artists said that since summer of 2014, which saw an estimated 2,100 deaths in the Gaza Strip, Palestinians have enjoyed "no respite from Israel’s unrelenting attack on their land, their livelihood, their right to political existence." 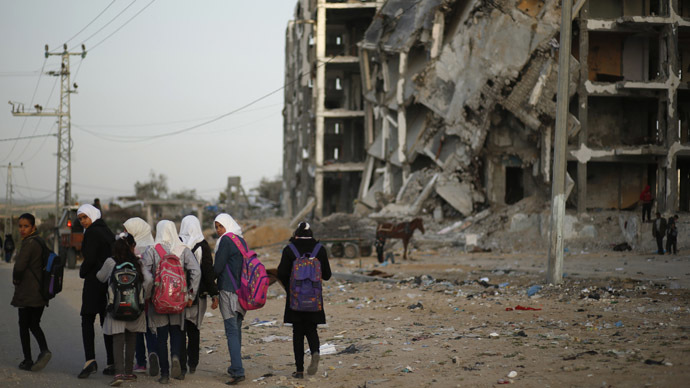 An investigation carried out by AP has recently showed that 508 of 844 victims in air strikes on residential buildings during Israel’s Operation Protective Edge that unfolded in Gaza the previous summer were women, children and the elderly. The agency studied 247 attacks that targeted residential buildings only – out of about 5,000 strikes conducted by the Israeli forces. Under the rules of war, civilian homes cannot be used as targets for air strikes. The probe concluded that only about 10 percent of those killed in the strikes were confirmed or suspected militants. Preliminary UN figures have demonstrated that the total death toll from the 50-day conflict – the third and most tense between Israel and Hamas since 2008 – was 2,205 people. 66 percent of the toll were Palestinian civilians – 1,483 people. On the Israeli side, 66 soldiers and six civilians were killed. Palestinian leader Mahmoud Abbas has asked the International Criminal Court to look into the conflict. Israeli government withheld crucial tax funds in response to the Palestinian move to file “war crime” charges against it with the ICC. The EU's foreign policy chief called Israel’s move to freeze the transfer of Palestinian tax revenues a violation of the Oslo Accords. Palestinian leader also said that continued settlement construction would prevent the resumption of peace talks with Israel. "We, the Palestinians, believe that the only way to achieve peace is through negotiations," Palestinian news agency Wafa quoted him as saying. "When we approach any state with a request to recognize the State of Palestine or support us in the UN Security Council, it is not requested to antagonize Israel, but to support the Palestinians’ right to statehood."